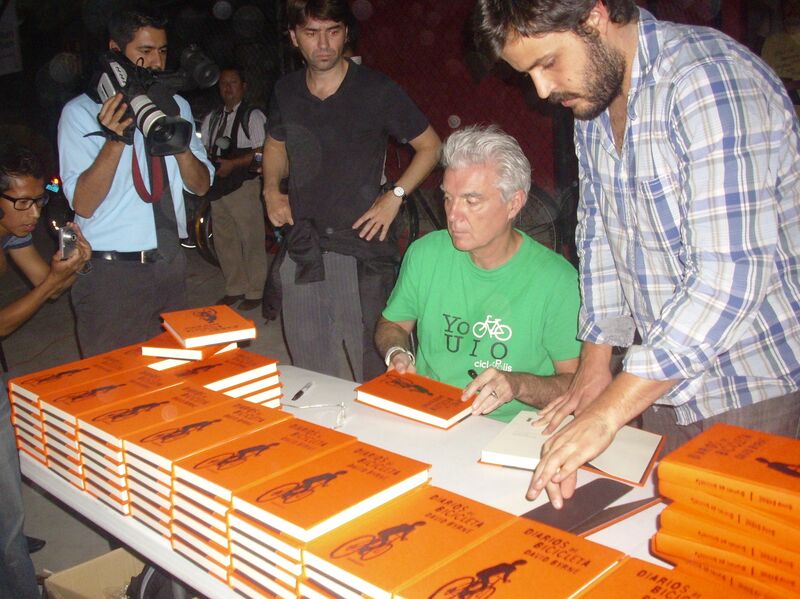 David Byrne came to Guadalajara last week to talk about bikes, mostly. I think he probably played a gig here too, but no one gave me press tickets to that. To older folk, David Byrne is best known as the singer of Talking Heads. To my generation he’s probably more famous for that song “Lazy” he did with X-Press 2 back in 2002. In an event tragically marked by the death of a local cyclist, U.S-based rock star David Byrne called for Guadalajara authorities to invest in cycling safety and infrastructure at a conference on urban mobility held in the The Roxy, an iconic city concert hall that was reopened especially for the occasion. After shooting to fame with Talking Heads’ hits such as “Psycho Killer,” “The Road to Nowhere” and “Burning Down the House,” the Scottish-born singer has pursued a successful solo career, experimenting with a diverse range of collaborators while also dabbling in art, photography and writing. A keen cyclist, Byrne has been promoting the Spanish-language release of his book, “The Bicycle Diaries,” during his current tour of Latin America. The city is a notoriously dangerous environment for cyclists. As if to cruelly emphasize the problem, a young cyclist was hit by a bus and killed instantly while Byrne was inside signing autographs. The event also marked the reopening of the Roxy, albeit only temporarily. Once a focal point of the city’s music scene, the historic venue has hosted concerts by the likes of Radiohead and Manu Chao. The event organizers spoke of their pride at “reclaiming” this “symbol of urban culture,” but it only had permission to host this one event and will not reopen permanently until its licensing debts of 40,000 pesos have been repaid. The organizers can point to some signs of progress in their campaign for a car-free city. In a trial run on Saturday, July 30, the left lane of Guadalajara’s Avenida Juarez will be closed to cars and open only to bicycles from 10 a.m. to 1 p.m.